The Royal is eastern Ontario’s largest and one of Canada’s foremost mental health care and academic health sciences centres. Our mandate is simple: to get more people living with mental illness into recovery faster. The Royal combines the delivery of specialized mental health care, advocacy, research and education to transform the lives of people with complex and treatment-resistant mental illness. At The Royal, care informs research and research informs care. We use cutting-edge research platforms – including brain imaging and translational neuroscience – all of which promise to improve both our understanding and treatment of mental illness. The field of mental health is the most complicated health challenge our society faces today. With every affected individual displaying symptoms that are unique to them, successful diagnosis and treatment rates are just too low. 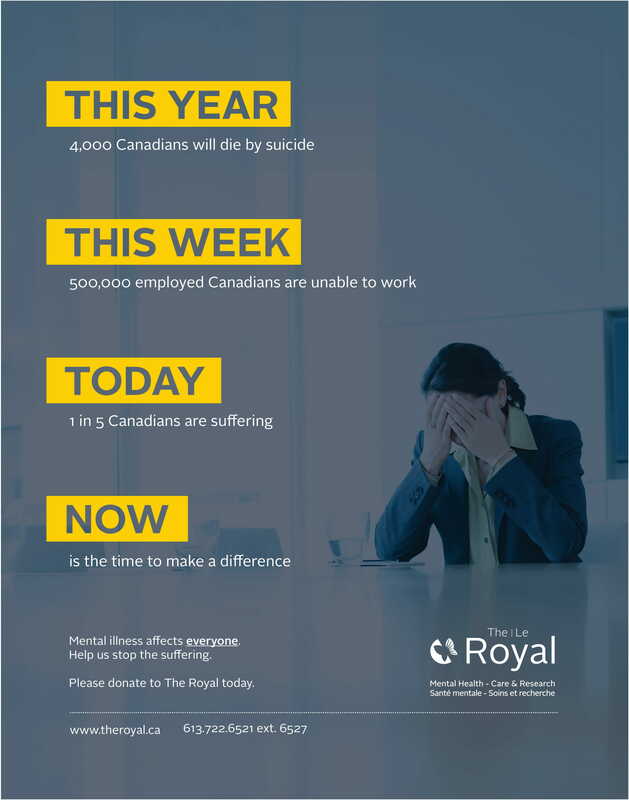 By supporting The Royal, you are a part of a revolution in mental health research and patient care. Together, we can shift the landscape of mental health in our community and in Canada. Better research means better care. Mental health treatment currently stands where we were with cancer or heart disease treatment decades ago. There is still so much that we don’t know about the brain and its connections to the mind. We know that mental illness develops when there are “malfunctioning” circuits in the brain, but we still need to understand why, when and how this is happening, in order to offer more personalized and effective care. At The Royal’s Institute of Mental Health Research (IMHR), our scientists are hard at work making innovative discoveries that are helping to close existing knowledge gaps, and are contributing to improved, evidence-based mental health care for individuals in our community and beyond. Left to Right: Dr. Georg Northoff; Dr. Zul Merali, president & CEO of The Royal’s IMHR and Dr. Pierre Blier. Work led by Dr. Pierre Blier, director of our Mood Disorders Research Unit, for instance, offers hope to patients via a cutting-edge treatment that uses ketamine to effectively treat those who have been highly resistant to typical antidepressants. Together with Dr. Georg Northoff, director of Mind, Brain Imaging and Neuroethics Research at the IMHR, Dr. Blier is also using the cutting-edge technology at our state-of-the-art Brain Imaging Centre to monitor and map patients’ responses to ketamine in order to understand the underpinnings of suicide ideation and effectively optimize treatment. Just like we can forecast heart disease through cholesterol tests, or cancer through mammograms, our scientists are working to develop the capacity to help prevent mental illness from developing in the first place. Gifts to The Royal can be directed to patient care, research, education or the most urgent priorities of the hospital. Become a leader for mental health. Now is the time to help make a difference. The Royal’s Gala is one of Ottawa’s premier social events, with more than 550 leaders in the corporate, political and non-profit sectors. As a corporate sponsor you will receive prominent logo visibility in advertisements, newsletters and social media, reaching thousands of businesses and individuals. If your company is interested in becoming a sponsor for our 2019 Inspiration Awards Gala, please contact us at 613-722-5261 x 6707 to learn about our sponsorship levels. In 2010, former NHL hockey player Luke Richardson and Stephanie Richardson lost their 14 year-old daughter, Daron, to suicide. The family decided to turn their very private pain into a public call to action. DIFD was created at The Royal to support youth mental health awareness, education and research. Thanks to community donations to DIFD, The Royal recently welcomed Dr. Zachary Kaminsky as the newly appointed DIFD Mach-Gaensslen Chair in Suicide Prevention Research at The Royal’s Institute of Mental Health Research. Dr. Kaminsky is developing an algorithm that uses artificial intelligence to predict suicide risk based on Twitter messages. The algorithm is still in its early days, however Dr. Kaminsky’s hope is that identifying risk will help lead to early intervention and fewer suicides, particularly in youth. President and Executive Consultant, Halo Management Consulting Inc.
Chief Financial Officer, Modern Niagara Group Inc.
President, Ron Eastern Construction Ltd.